I am using GRASS GIS 7.4 and I have a DEM as points in a vector format and want to turn it into a raster. and selected z, assuming this is the elevation. I run the function and it works, it creates a raster, but the raster is empty. I did a query in one of the vector points and could see that the elevation is in Point_height, but I do not know how to use this as the source of the values for the raster. Does anyone have any solution for this? And, (FAQ #0 in GRASS) don't forget to set the region to the input vector extent before any interpolation or any other raster operations. 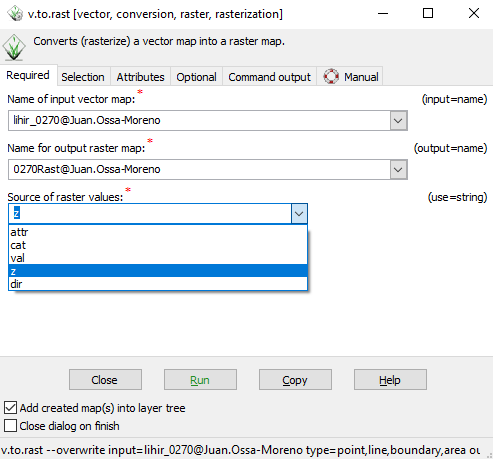 Even though, as Hasnein pointed out, you probably want one of the interpolation algorithms, to address the specific question on v.to.rast: You can choose the "Raster values = z" option only if the vector is 3D. 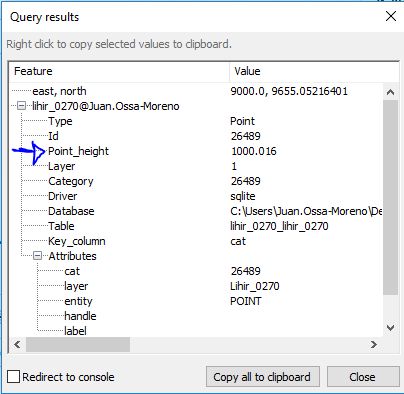 If instead you have a column with elevation such as "Point_heights" then choose Raster values = 'attr' and in the "Attributes" tab select the Point_heights column. Based on what you stated about your point data, v.to.rast or v.to.rast3 are not the right tools. You should try using one of the raster interpolation modules in GRASS. Try the following tools and depending on your data quality, different method can give you slightly different DEM and you have to decide which one you want go for. Please consult the respective GRASS module manuals for how to use your x,y and z values. You can also use SAGA interpolation tools (you might need to install it within QGIS depending on which version you are using) to produce similar DEM. Not the answer you're looking for? Browse other questions tagged grass dem rasterization or ask your own question. How to combine polygons in a vector with GRASS? Is it possible to manually correct a raster DEM (OpenSource)? Generating DEM from contour Shapefile using QGIS?